To ‘set-up’ means to make all necessary adjustments and repairs to maximise the playability of a particular instrument. Often, new instruments (even in the €2000 to €3000 price-range) require some level of set-up. Set the appropriate neck-relief with the truss rod. Set the bridge radius to match the fingerboard. Set the nut action (slot depth). Set the action on the treble and bass side to precise measurements. Most of the big companies list their factory specs for the purpose of servicing. We have most of these measurements on hand and they serve as a good reference point for normal action. On acoustic guitars, the Taylor spec is for a low action – .049″ on treble e; and .078″ on bass e @12th fret, with .005″ neck relief (2013 spec sheet). This is an indication that the company is confident about it’s fretwork. On the other hand, Fender specify .063″ on both sides with .010″ neck relief (Strat/Tele, with 9.5 – 12″ radius). Most players prefer a lower action on the treble side and often fretwork is needed to achieve this. This applies to new instruments as well as ones that are played-in. If you’re looking for a comfortable playing action on an acoustic guitar, 2mm on the bass is about right for fingerstyle. 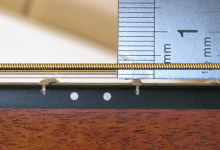 An action of 3mm is high but good for those with a heavier strumming style (In this case, We advise tapering the bridge so the action is lower on the treble side). 4mm action is very difficult to play for most people. To get an idea where you’re at currently, measure at the 12th fret like in the photograph below. If you want the treble side set very low – between .04 and .05″ (1mm and 1.3mm), the frets must be perfectly level and the neck relief minimal. Our belief is that if an electric guitar works well acoustically, this will result in better tone and clarity when amplified. Neck Relief: When a guitar is built properly the fingerboard is shaped dead straight; a perfectly flat plane. After the frets are installed they should be skimmed slightly to ensure the top surface is still completely flat. When the strings are installed they pull on the neck and bend the flat surface of the fretboard. Neck relief is a measure of this. An example of low relief is .05mm, while 1mm would represent very high relief. Truss Rod: This is a long threaded bolt inside the neck running along it’s entire length. Ideally, tightening the rod pulls the neck back into it’s straight position and counteracts the pull of the strings. Bridge Saddle: Typically made from bone or plastic (or metal for electric guitars), this is point of contact of the strings at the body. The height is set with after neck has been adjusted to the required relief. This determines the action. The top surface of the bridge should be curved to correspond with the curvature of the fingerboard. The Nut: This is the piece of plastic or bone where the strings rest at the headstock. It represents the start of the fingerboard, or ‘zero’ fret position. The nut is grooved to hold the strings in place. The depth of these grooves is very important in how the guitar feels and intonates. This video demonstrates setup on a modern D’Angelico Excel archtop guitar. It highlights some of the problems associated with factory guitars like these and some possible solutions. To make an appointment and find out what can be done to improve your instrument, please contact John by phone or email. Feel free to email relevant pictures. An accurate quote for work needed can be given once the instrument has been checked properly.